Hadi Najafabadi, H., Keshavarz Moraveji, M. (2016). Three-dimensional CFD modeling of fluid flow and heat transfer characteristics of Al2O3/water nanofluid in microchannel heat sink with Eulerian-Eulerian approach. Iranian Journal of Chemical Engineering(IJChE), 13(4), 46-61. Hossein Hadi Najafabadi; Mostafa Keshavarz Moraveji. "Three-dimensional CFD modeling of fluid flow and heat transfer characteristics of Al2O3/water nanofluid in microchannel heat sink with Eulerian-Eulerian approach". 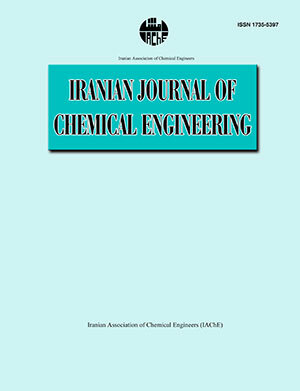 Iranian Journal of Chemical Engineering(IJChE), 13, 4, 2016, 46-61. Hadi Najafabadi, H., Keshavarz Moraveji, M. (2016). 'Three-dimensional CFD modeling of fluid flow and heat transfer characteristics of Al2O3/water nanofluid in microchannel heat sink with Eulerian-Eulerian approach', Iranian Journal of Chemical Engineering(IJChE), 13(4), pp. 46-61. Hadi Najafabadi, H., Keshavarz Moraveji, M. Three-dimensional CFD modeling of fluid flow and heat transfer characteristics of Al2O3/water nanofluid in microchannel heat sink with Eulerian-Eulerian approach. Iranian Journal of Chemical Engineering(IJChE), 2016; 13(4): 46-61. 1Department of Chemical Engineering, Amirkabir University of Technology (Tehran Polytechnic), Tehran, Iran. In this paper, three-dimensional incompressible laminar ﬂuid ﬂow in a rectangular microchannel heat sink (MCHS) using Al2O3/water nanoﬂuid as a cooling fluid is numerically studied. CFD prediction of fluid flow and forced convection heat transfer properties of nanofluid using single-phase and two-phase model (Eulerian-Eulerian approach) are compared. Hydraulic and thermal performance of microchannels are investigated according to the results of the friction factor, pumping power, average heat transfer coefficient, thermal resistance, average temperature of the walls and entropy generation. In addition, due to the CFD results, two correlations for predication of Nusselt number and friction factor are presented. Comparing the predicted Nusselt number using single-phase and two-phase models with experimental data shows that the two-phase model is more accurate than single-phase model. The results show that increasing the volume fraction of nanoparticles leads to increases the heat transfer coefficient and reduces the heat sink wall temperature, but it leads to the undesirable effect of increase in pumping power and total entropy generation. Zhang, H., Shao, S., Xu, H. and Tian, C., "Heat transfer and flow features of Al2O3–water nanofluids flowing through a circular microchannel : Experimental results and correlations", App. Therm. Eng., 61, 86 (2013). Chol, S., "Enhancing thermal conductivity of fluids with nanoparticles", ASME-Pubs-Fed, 231, 99 (1995). Ahmed, M. and Eslamian, M., "Laminar forced convection of a nanofluid in a microchannel: Effect of flow inertia and external forces on heat transfer and fluid flow characteristics", App. Therm. Eng., 78, 326 (2015). Jung, J.Y., Oh, H.S., and Kwak, H.Y., "Forced convective heat transfer of nanofluids in microchannels", Int. J. of Heat Mass Trans., 52, 466 (2009). Yang, Y.T., Tsai, K.T., Wang, Y.H. and Lin, S.H., "Numerical study of microchannel heat sink performance using nanofluids", Int. Commun. Heat Mass Trans., 57, 27 (2014). Bejan, A., "Second law analysis in heat transfer", Energy, 5, 720 (1980). Bejan, A., "General criterion for rating heat-exchanger performance", Int. J. Heat Mass Trans., 21, 655 (1978). Singh, P.K., Anoop, K., Sundararajan, T. and Das, S.K., "Entropy generation due to flow and heat transfer in nanofluids", Int. J. Heat Mass Trans., 53, 4757 (2010). Mehrali, M., Sadeghinezhad, E., Rosen, M.A., Akhiani, A.R., Latibari, S.T., Mehrali, M. and Metselaar, H.S.C., "Heat transfer and entropy generation for laminar forced convection flow of graphene nanoplatelets nanofluids in a horizontal tube", Int. Commun. Heat Mass Trans., 66, 23 (2015). Hassan, M., Sadri, R., Ahmadi, G., Dahari, M.B., Kazi, S.N., Safaei, M.R. and Sadeghinezhad, E., "Numerical study of entropy generation in a flowing nanofluid used in micro and minichannels", Entropy, 15, 144 (2013). Ho, C.J., Wei, L.C., and Li, Z.W., "An experimental investigation of forced convective cooling performance of a microchannel heat sink with Al2O3/water nanofluid", App. Therm. Eng., 30, 96 (2010). Akbari, M., Galanis, N. and Behzadmehr, A., "Comparative assessment of single and two-phase models for numerical studies of nanofluid turbulent forced convection", Int. J. Heat Fluid Flow, 37, 136 (2012). Schiller, L. and Naumann, A., "A drag coefficient correlation", Vdi Zeitung, 77, 51 (1935). Kalteh, M., Abbassi, A., Saffar-Avval, M., and Harting, J., "Eulerian–Eulerian two-phase numerical simulation of nanofluid laminar forced convection in a microchannel", Int. J. Heat Fluid Flow, 32, 107 (2011). Kalteh, M., "Investigating the effect of various nanoparticle and base liquid types on the nanofluids heat and fluid flow in a microchannel", App. Math. Model., 37, 8600 (2013). Salman, B.H., Mohammed, H.A., and Kherbeet, A.S., "Numerical study of three different approaches to simulate nanofluids flow and heat transfer in a microtube", Heat Transfer—Asian Research, 45, 46 (2016). Fani, B., Kalteh, M., and Abbassi, A., "Investigating the effect of Brownian motion and viscous dissipation on the nanofluid heat transfer in a trapezoidal microchannel heat sink", Adv. Powder Tech., 26, 83 (2015). Ranz, W. and Marshall, W., "Evaporation from drops", Chem. Eng. Prog., 48, 141 (1952). Anderson, J.D., Computational fluid dynamic: The basics with applications, McGraw-Hill, New York, (1995). Patankar, S.V., Numerical heat transfer and fluid flow, Hemisphere, New York, (1980).